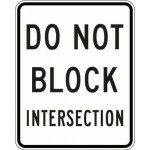 The term regulatory sign describes a range of signs that are used to indicate or reinforce traffic laws, regulations or requirements which apply either at all times or at specified times or places upon a street or highway, the disregard of which may constitute a violation, or signs in general that regulate public behavior in places open to the public. One type of regulatory signs are traffic signs intended to instruct road users on what they must or should do (or not do) under a given set of circumstances. Other types may be signs located on streets and in parking lots having to do with parking, signs in public parks and on beaches or on or in architectural facilities prohibiting specific types of activities. flow, and the local regulations and laws. 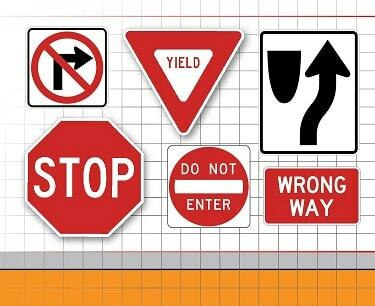 The shapes and colors of traffic signs have specific meanings and you have to be able to recognize them immediately. Why? Even if a stop sign is damaged or blocked by dirt or snow, you know by the octagonal shape and red color that you must stop. They warn you about hazards, identify your route, and direct the speed and movement of traffic. to the little blue rectangles that direct you to a library or hospital. 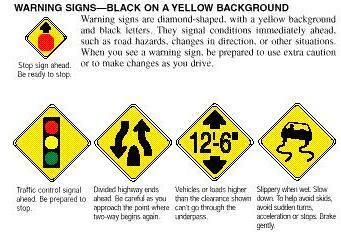 Learn the standard colors and shapes so you know what a sign means, even at a distance. For example, a rectangle is always a regulatory sign, telling you about laws and regulations or giving you instructions. One type of regulatory signs are traffic signs intended to instruct road users on what they must or should do (or not do) under a given set of circumstances. Other types may be signs located on streets and in parking lots having to do with parking, signs in public parks and on beaches or on or in architectural facilities prohibiting specific types of activities. 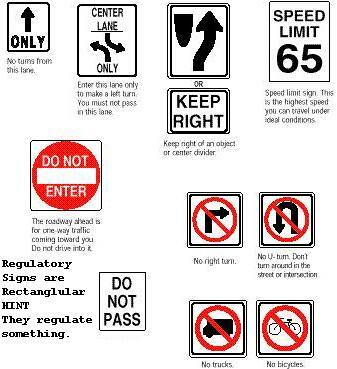 The term regulatory sign describes a range of signs that are used to indicate or reinforce traffic laws, regulations or requirements which apply either at all times or at specified times or places upon a street or highway, the disregard of which may constitute a violation, or signs in general that regulate public behavior in places open to the public. Examples of non-traffic types of regulatory signs might be tow-away signs for vehicles without disabled parking stickers or no-smoking signs where there are laws prohibiting smoking.